Israel is less than 100 years old. The Middle East was created 103 years ago for British and French control. The US continually justifies modern-day Israel’s existence by referencing Biblical text for its presence in Palestine. If something exists, why is it necessary to continually prove its presence as a nation? Yet, textbooks have recorded that Biblical Judaism no longer exists. A 1947 US and British Declaration is responsible for the land mass named “Israel.” On May 14, 1948, David Ben-Gurion, head of the Jewish Agency, proclaimed the establishment of the State of Israel. US President Harry S. Truman recognized the NEW nation. After 60 years, a “Prove Israel Exists Clause” continues confrontationality in the courts, Bible, history books, and the minds of people who declare themselves Judo-Christians. Hebrew Israelites (Kingdom of Judah) existed in the Bible during King Solomon's time, but today in Modern Israel the group is referred to as Beta (second-in-line). They are called "Falasha meaning Strangers." The Abyssinian Jews have a genealogical connection directly to Haile Selassie and Menilek, the son of Solomon and the Queen of Sheba. The citizens and descendants of the Kingdom of Judah—were and are Israelites of the Roman Bible. The Biblical translators/writers wrote about events in the Bible happening 900 years after the events took place. The New Testament Gospels, for example, were written 100-300 years after Christ died. Archeological Adam and Eve did not exist. Historical Israel does not exist in archaeological remains. Biblical Israel exists only in Scripture. Modern-day Israel is land set up by the US and Britain in 1947. People who call themselves Jews living in Palestine are Khazars who adopted Judaism as their religion in A.D. 744 - 840. The Hebrew Bible (Old Testament) is an allegorical creation representing people who converted to Judaism and literally wrote themselves on the pages of the Old Testament. The Jews in Israel account for 92% Ashkenazim Jews and have converted to the Religion. Their ancestral land was Caucasus (Russia). Christianity was conceived under Constantine, who invaded Egypt in 332 BC. Constantine consolidated Greek Mythology into the Bible. Hieroglyphical pictures painted on temple walls are far from the Shakespearean like prose with rhyme schemes and sonnets printed as text in what is referred to as the “Word of GOD in the Bible.” The Pyramid Texts from which the Bible evolved, are a collection of ancient Egyptian religious manuscripts from the Old Kingdom in cuneiforms from for which the Bible was translated/written. King James’ Bible was written to support the authority of a king. The Bibles we have today are five linguistic removes from the original Bible. Stories about the promise given to patriarchs in Genesis are not historical but historically determined expressions about Israel's relationship to its God at the time. The Texts were carved on the walls and sarcophagi of the pyramids at Saqqara during the 5th and 6th Dynasties dated 2400–2300 BC. Unlike the later Coffin Texts and Book of the Dead, the Pyramid Texts were reserved solitarily for the Pharaoh—not Gutenberg or King James. Following the earlier Palermo Stone, the Pyramid Texts mark the next-oldest known mention of Osiris, who became the most important deity associated with an afterlife in the Ancient Egyptian Religion. 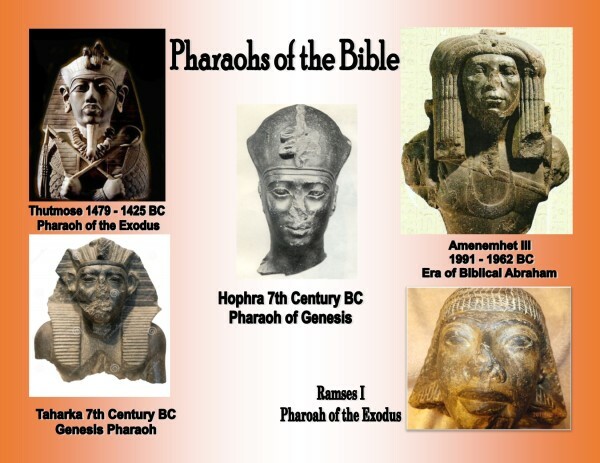 Biblical characters are based on Egyptian Pharaohs. Abraham and/or (Amenemhet the first reign: (1991–1962 BC) found the Land of Canaan inhabited by Hamitic people upon his arrival. Genesis 15:18 clearly reaffirms the boundaries of land inherited by Abraham (Genesis 2: 8-14) from the Nile to the Euphrates including the Garden of Eden and the Fertile Crescent. Genesis 15:19-21 lists the Hamitic Tribe people and nations who inhabited the region promised to Abraham in Genesis 15:1-21. Black Israelites (Jews) were in Africa 1,300 years before the birth of Christianity and 1,800 years before the birth of Mohammed. Most readers feel the Bible is the “Inspired” word of God, while some believe the Bible is an ancient book of stories recorded by man. Example: The Ashkenazim currently living as Jews in Palestine are referred to as “Authentic” (Alpha--FIRST) when the following Jewish groups have historicity to Biblical periods. Most of today's Jews in Palestine are not descended from Abraham but have converted to the religion. If you read the Bible right now, it still tells that God Promised Land to the ‘seed of Abraham’ – the literal seed of Abraham. Evangelicals and other Christians believe in a spiritual Israel--not a physical Israel. Israel believes it has the right to inherit the biblical land that God promised them. These European Jews didn’t show up until AD 861. Where is their Biblical evidence? While the Palestinians invoke rights that are internationally recognized, Israel invokes rights that are solely recognized at the national level by the Israeli state itself. The Cushites of Mesopotamia were Ethiopians (Judges 3:3-10). Cushites were Edenites from the Land of Eden. The Sudanese are synonymous with Watusi and Zulu, 400 years from 1846-1446 BC. The Cushites of Mesopotamia are identical with Ethiopians. Until the 4th Glacial Epoch, flat-nosed Negroes were the only humans (Diop, 67-8). Archaeological evidence includes Semitic Languages which are closely related to African Languages and are spoken in Syria, Palestine and related to Berber, Libyan, ancient Egyptian and Coptic Cushite (Greenberg pp. 110-111). Twenty years ago, South Africa was the only place in the world where the bones found allowed scientists to reconstitute the genealogical tree of mankind uninterruptedly from its beginning until today. European Jews do not show up until the sixth century AD, but the Bible was written from the Pyramid Texts dating c. 2400-2300 BC – Genesis - Chapter 10 saying: Now these are the generations of the sons of Noah, Shem, Ham, and Japheth: and unto them were sons born after the flood. 10:03: And the sons of Gomer; Ashkenaz, and Riphath, and Togarmah (4,000 years ago). Where sis the word “Ashkenaz” come from, and how is that possible? Egypt as a starting point--all the ancient civilizations in the world, Egypt has more ancient documents and other artifacts than any other civilization one could speak of. So, when you hear historians talking about "Sumer" and "Babylon," and all those other places, theoretically, they cannot show any artifacts. Firsthand information is the best proof. Bones and other remains of Zinjanthropus Boisei about 1.8 million years ago exist in museums. But no one can show the bones and remains of Adam and Eve, et al. The Ptolemaic Kingdom was a Hellenistic empire based in Egypt creating Greek cities and nations in Asia and Africa. The Ptolemaic Kingdom was founded in 305 BCE by Ptolemy I Soter. He declared himself Pharaoh of Egypt and created a powerful European dynasty that ruled an area stretching from southern Syria to Cyrene and south to Nubia. Alexandria became the capital city and a major center of Greek culture and trade. To gain recognition by the indigenous Egyptian populace, the Ptolemy named themselves successors to the Pharaohs. The later Ptolemies took Egyptian traditions by marrying their siblings, had themselves portrayed on public monuments in Egyptian style and dress, and participated in Egyptian religious life. Egyptian chronology and the Bible are used to attack the Bible’s historical accuracy making traditional chronology inconsistent with the Bible. It seems the first settlers of Egypt were descended from Mizraim, the son of Ham (Genesis 10:6, 13). That’s why, at the first dynasty, there bursts on the scene a people of culture and skill who already possessed a form of writing. Remember, the Bible came from the temple walls. The Old Testament books were written 5,000 years after the original text. The New Testament books were written 100 years after discovering the original text. Are hieroglyphs inspired words of God or translations of the original text? In the Book of Revelation, a coalition is foretold to attack Israel (Remember, Israel only exists in Scripture—Land set up by US and Britain in 1947) from the north in a bid to destroy it during the Earth's "last days," commonly known as the "war of Gog and Magog." In today’s media theater, Magog refers to Russia and the republics of the former Soviet Union. Some argue the exact location has not been fully ascertained, and the word Magog may simply be a generalization for an enemy of Israel leaving the location open. In this case, an enemy to Palestine is the US ally and represents the Middle Eastern Countries. Remember, the Middle East is a title given by Britain signifying a territory set up to define the distance to and from Europe. The converted Jews who live in Palestine formerly came from Russia Caucasus People. Both scenarios did not exist when the Bible was translated. Gog is commonly believed to represent a person's name rather than a place. Gog could mean a tyrannical leader who hatches an evil plan – in today's reality this "honor" could be most suited to the US defending the Declaration set up in 1947 against the Arab world. Gog and Magog Represent Russian Khazars. Benjamin Freedman writes: Jesus is first referred to as a so-called "Jew" in the revised 18th-century editions in the English language of the 14th century first translations of the New Testament into English. The history of the origin of the word "Jew" in the English language leaves no doubt the 18th century "Jew" is the 18th century contracted and corrupted English word for the 4th century Latin "Iudaeus" found in St. Jerome's Vulgate Edition. There is no longer doubt. There is not now nor was there ever an equivalent letter "j" in the 22 letters of the Hebrew alphabet. Nor is there any Hebrew letter that carries even an approximate sound of the consonant letter "j." Neither is there a letter 'j' in the Greek alphabet. The letter 'J' not being in Aramaic, Hebrew, and Greek alphabets. Jewish Encyclopedia. (1973). and A. N. Poliak, Professor, Medieval Jewish History, Tel Aviv University. On one side, particularly in the West, though there are thousands of stories from various cultures, is the Creationist view (Adam & Eve). This is a view based on faith in the accuracy of Christian Scriptures. Although recently, the terminology has been gradually leaning towards a new term, “Intelligent Design.” This is seen as an effort of being more convincing. Debating human origins is only the beginning. Probably the most volatile topic in the discussion of religion is how one approaches the subject of a Savior. In most of the western culture, the subject of a Savior centers on Jesus, the Christ. There is a clear explanation for this. When the Emperor of the Roman Empire converted to Christianity, that reverberated throughout the territories under Roman control. In far too many cases, you either converted or faced death. That meant a widely enormous influence in Europe, which colonized the western world. When the Europeans settled in the Americas, they brought their religion with them. Practically everyone under their control had to convert to Christianity, sometimes by very brutal force, as witnessed during the Crusades and Inquisitions in Europe, and the genocide of Native Americans. Christianity, aided by Judaism, were in full control during the initiation of the Atlantic slave trade. Under the banner of Islam, approximately 1,000 years before the Christians, the East Indian Ocean slave trade was created and still exists today. When assessing the validity of a Savior or Messiah, two major events are consistently mentioned, the Immaculate Conception or virgin birth, and the Resurrection or rising from the dead and ascending into Heaven or Paradise. Nothing supersedes these two occurrences as the most important in classifying one as a Savior. The problem we face here, particularly in the western world, is associating these events with only one being, Jesus, the Christ. Things become very difficult for the western mind when looking at these two events from other parts of the world, during different historical periods, even before the birth of Jesus. These two events have been associated with various other beings in different cultures. The first human recording of these two events are found in northeast Afrika, Kemet, which the Greeks called Egypt, around 4100 B.C.E. It focuses on Ausar (Osiris), Auset (Isis) and Heru (Horus), reputably known as the original trinity; the father, the mother, the son [parentheses indicates Greek names]. There are temples in Kemet where these events were drawn in stone thousands of years before the birth of Jesus. The Temple of Luxor, inscribed by King Amenhotep III (1538-1501 B.C.E.) shows four scenes on the birth of Heru (Horus): The Annunciation, The Immaculate Conception, The Birth and the Adoration. In the Temple of Seti I, in Abydos, the home of Ausar (Osiris), and in the temple at Denderah, one can see The Resurrection of Heru (Horus). Books such as: The Egyptian Book of the Dead (originally titled The Book of Coming Forth by Day and by Night) by E.A. Wallis Budge; The Coffin Text and The Pyramid Text; The World’s Sixteen Crucified Saviors by Kersey Graves; and Christianity Before Christ by John G. Jackson, among others, have recorded these various stories. Some Egyptologists feel that the triad of deities: Amon, Mut, and Khonsu, at the temple in Karnak, was copied by the early Christians to form the present Holy Trinity. As a side note, according to most Christian scriptures, Jesus was said to have been born in Bethlehem, or Nazareth. In the Coptic writings, where the oldest Christians called Copts still reside (Kemet and Ethiopia), and according to Dr. Yosef ben-Jochannan, a Kemetologist, born in Ethiopia, Jesus was said to have been born in Kemet (Egypt). In Matthew 2:15, it still says, "Out of Egypt shall I call my son!" Contrary to written sources, Kemet (Egypt) is where Christianity was born, while Ethiopia built the first Christian Church and was the world’s first and oldest Christian nation. Christianity was originally an Afrikan religion, as was the Hebrew Afrikan religion called Judaism. When the Roman Empire converted to Christianity (312 A.D.), and wrestled it from Afrika, the story was changed. This was further confirmed at the Council of Nicea, on May 20th, 325 A.D., called by the Roman Emperor Constantine, and attended by 318 bishops and religious scholars. Together, they formed a new Imperial State Religion, known today as The Roman Catholic Church. Eighteen books were removed from the original scriptures at this conference. They are called the Apocrypha. The first book in particular, “The Book of Mary,” states that Mary was born of a virgin birth, giving her divine status, which was stripped during the conference. Also, it states that she had a son before Jesus by virgin birth, James the Lesser. Most Christian denominations do not lend any credence to the Apocrypha. After much editing, it remains in the Catholic Bible. As mentioned earlier, other beings were associated with the Immaculate Conception and Resurrection story. Their life stories parallel that of Jesus, which parallel that of Heru (Horus). In Mexico, in the Codex Vaticanus, this being is called Quexalcote. In China, in the History of the Rajahs, the name Xaca is mentioned, and also Yu. In India, they are called Buddha and Krishna. Sakia, Scipio, Arion, Zulis, Bacchus, Alcides, and Hesus are some of the beings associated with the two events previously mentioned. In actuality, the virgin birth/resurrection story has floated all over the world, in various cultures, various interpretations, before, during and after the Mary Jesus version. The information revealed here is simply an effort to show that where one is born and the culture one is raised in can influence the story and belief one subscribes to. When surveying world religious views, we find that each culture has its own rituals, realities and beliefs. No effort is made here to suggest which or what is the one truth, other than to say that one story, virgin birth/resurrection, is told different ways with different names all over the world. What is suggested is that the summation of all that has been discussed solidifies the global belief in a Supreme Being, and that the human mind has created numerous interpretations. It begins with Auset (Hathor/Isis), she was the world’s first known deity, and repeated throughout the ages in various forms, “I Auset (Isis) am all that has been, that is or shall be.” Belief in her was so strong the city of Paris, France was named after her.